Aalayam - Colors, Cuisines and Cultures Inspired! : Dasara Bombe Party - Episode 1! Dasara Bombe Party - Episode 1! Here’s unfolding Episode 1 of the joyous Dasara Bombe Party! Thank you all for sending in your pictures and heart felt Dasara Bombe stories to Aalayam. Your pictures and stories are making our Dasara Bombe Habba rich, layered and textured. And we are blown away by your enthusiasm, zest and passion! Your pictures and stories are reinforcing our belief that we are doing good, to keep up the age-old, but well-worn traditions in these modern times, to suit our convenience, and to fuel our creative energies! It's so exciting to see various affectionate renderings of the well-loved bombes, and the stories surrounding each picture!! Without much ado, I present to the Aalayam family, your Bombe pictures and stories! Coming from Karnataka, "Mysooru Jumboo Savari"(Dasara procession) is the first thing that comes to my mind when I think of Navaraathri. Dasara is considered as "Naada Habba" (state festival), which symbolizes the tradition and rich cultural history of the state and Jumboo Savari is a glimpse of that. I was thrilled when I found these beautiful, hand painted dolls and decided to display them as main theme for our first gombe habba, home away from home. Navrathri on our home is a season of abundance - of festivity, dolls, dance and of course delicacies. I love the whole creative process: setting up, unwrapping the dolls that have been tucked away safely for a whole year, sharing stories about them with my son as we set up and having friends over to share our culture with them. We have been fortunate enough to inherit some dolls that are more than 35 years old from my husband's home as well as mine. We grew up seeing some of these dolls in our golu and it is nostalgic to be able to share them with generation next now. For me it is extremely important to make children feel like they are a part of the process and this year's 'Houston' -complete with NASA, the never ending construction and the Houston zoo by my son is an attempt at that. 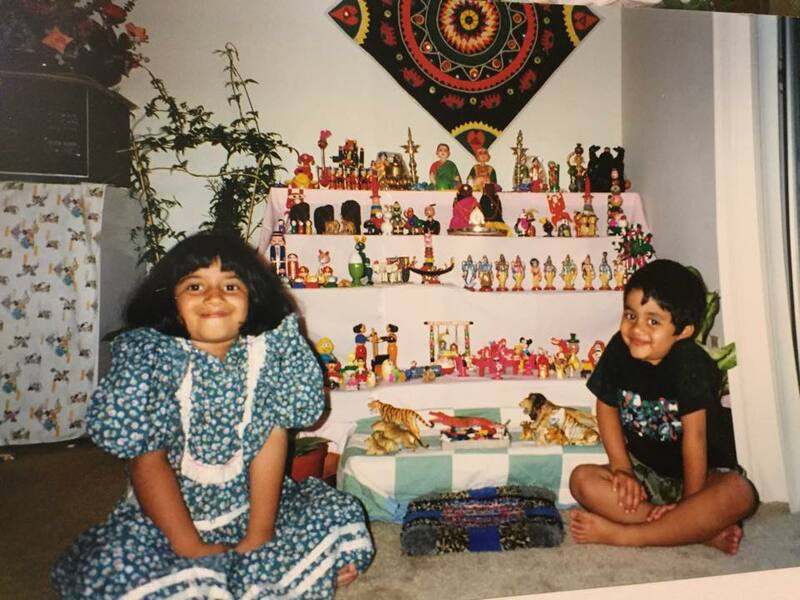 Over the years we have also had friends from different parts of the world give us dolls to add to our collection and it has been wonderful to see our golu grow from Indian to global. Dasara doll festival is celebrated during Navaratri. I want to talk about my Pattada Gombe. These are a pair of Rosewood dolls which I have dressed very colorfully using paper, silk and sequence material. These dolls are always dressed in traditional attire. Pattada Gombe depicts Lord Narayana and Goddess Lakshmi who take the form of King and Queen (Husband and Wife) and take part in Dasara festivities. 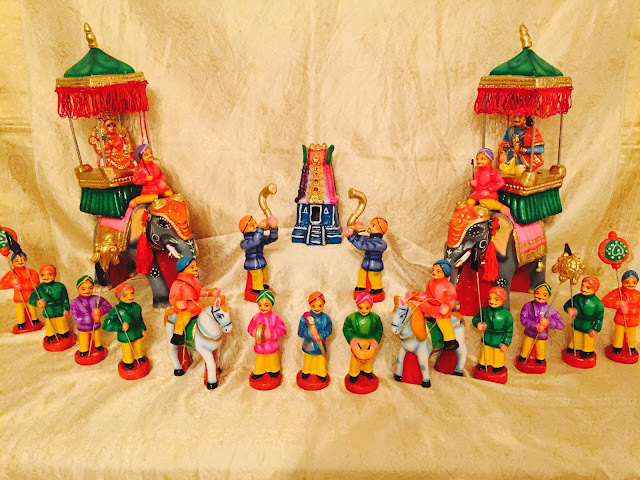 These Pattada Gombes are the main dolls , and are given special importance in Bombe Habba. 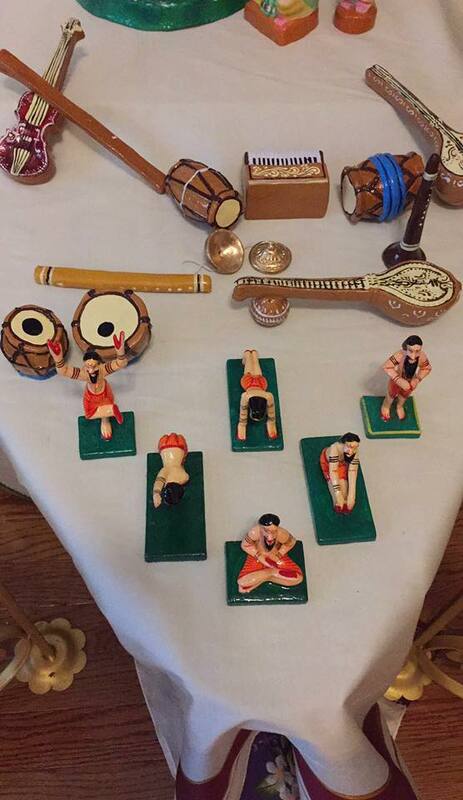 These dolls were handed over to me during my wedding by my parents to continue with the tradition of our Bombe Habba. My mother has always loved this unique festival of Bombe Habba and this has always been a time of fanfare, enthusiasm and fond memories for me. And over the years, while I have always enjoyed every bit of the process, from the careful unpacking to the loving display, I think Navaratri has taken on a whole new meaning with the arrival of my daughter. She has inherited my mother's love for the dolls and together, they have spent many a happy hour planning themes and arranging the display. It's so heartening for me to see my mom's happiness at seeing her enthusiasm reflected in her granddaughter's eyes. We try to add to the collection every year. And there are some old favorites that make an unfailing appearance. But, regardless of what dolls grace our house each year, I am most thankful and blessed for the precious memories being made and bonds that are being strengthened each time October rolls around. A combination of Music and Yoga is the answer to a blissful life! 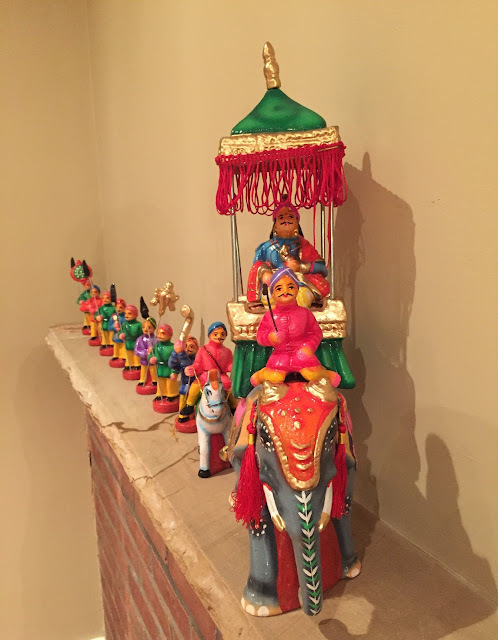 This Golu was special because it was the very 1st Golu we kept in 1998, when my kids were 6 and 4. The kids actually decorated the bottom 2 steps. Years later the tradition continues with bigger and grander displays, but the 1st is always the most special. Amazing right? Poignant, Picturesque and Perfect!! This community Dasara celebration is not over yet! Loved them all! Very interesting themes and layouts! Festivity and color all around!! Lovely feature!